For this month's Table for Two, I'll be chatting about The Bluebell Cafe and Alexa is featuring Kaylee's Creamery. 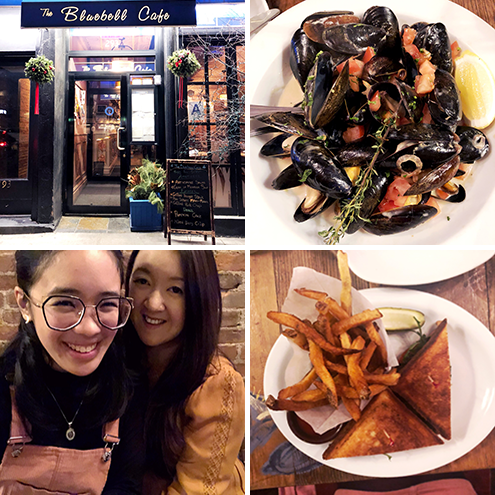 The Bluebell Cafe is a cozy yet surprisingly spacious cafe in Gramercy that I'd been wanting to check out. I have a feeling going there for brunch is probably even more enjoyable but that said, I liked their dinner menu! I can never resist mussels if I see it offered as an entree so I immediately knew what I was going to order. They were flavorful and fresh but the bowl was a bit on the smaller side compared to other restaurants I've been to that offer a similar entree. Luckily I knew I was getting ice cream afterwards so the smaller portion worked out. The service was okay but given how few people were there when we arrived, I did expect our food to come out faster and our waiter to be slightly more attentive. That said, we liked the cafe and the food but it didn't make it to our new favorites list. I would be willing to give brunch there a try though! Oooh I've never been to Bluebell for dinner- I've always gone for lunch! I love the name though because it reminds me of Hart of Dixie lol!